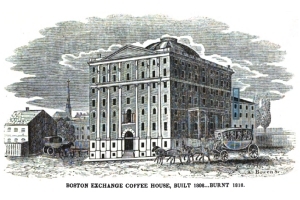 "On Tuesday evening, November 3, 1818, between 6 and 7 o'clock [pm], fire was discovered in the upper story of [a] magnificent edifice, the Boston Exchange Coffee House. The fire first broke out from the southwest corner of the seventh story. Although there were various rumors respecting its origin, the fact was never satisfactorily known, yet it is generally supposed to have caught from a defect in the chimney, and that the rapidity with which it spread, was owing to the fact that the workmen, in order to get rid of large quantities of shavings, stuffed them under the floors and inside the ceilings, while building the edifice. The fire soon communicated to the roof, and from the immense height of the pile, being two or three stories above the loftiest building in the neighborhood, it was impossible to reach the flames by the fire apparatus in use at that time, so that in about half an hour the entire buildings was on fire. There was a slight wind from the southwest which drove the flames and burning cinders towards the lower part of State Street. All the neighboring buildings were of course exposed, from the moment that the fire broke out from the roof and windows. The exertions of the firemen and every class of citizens were immediately conspicuous in every direction, and the fire was speedily extinguished wherever it caught, except in the immediate vicinity of the walls. The dome and roof of the Coffee House fell in about 9 o'clock, and some time after the north wall and part of the south fell, together with nearly all of the inner wall which surrounded the area. Before 12 o'clock the whole buildings, together with the building annexed to it on Devonshire street, including the four story building belonging to Major Prince was consumed. The buildings on Congress street, opposite the front of the Coffee House, were on fire for an hour or two, and in consequence of the height of the wall opposite and the narrowness of the street, it seemed impossible to save them; yet so constant and abundant was the application of water, that they were little burnt, except part of the roofs. The buildings on the north side of the Coffee House, between it and State street, were somewhat injured by the falling of the wall, but very little by fire. The Exchange Coffee House covered 12,753 feet of ground, measured 84 feet on the east front, and 132 on the north, and was seven stories high. The principle floor was one story from the ground, and from this to the dome, which covered the center of the building, was 83 feet. A large part of the north wall fell outward during the fire, and after striking the top of Rogers Building, crumbled down between it and the base of the wall. The northeast corner, extending to the first row of windows on the front and on the north, fell upon the south end of Suffolk building, without doing any great injury. From the immediate proximity of the various printing offices, they were almost all in imminent danger, not only from the falling of the huge walls, but from the intense heat. Nearly all of them suffered more or less. The larger part of the northerly wall being immediately opposite the Patriot office, and with twenty feet of it, fell and grazed the corner of it, and the printing materials were removed in great confusion by the citizens. The front wall on Congress street, remained standing by which the offices of the Daily Advertiser, Nathan Hale, in the Suffolk building; the Palladium, Young & Minus, the large book printing office and bindery of Wells & Lilly, the watchmaker's shop of Mr. Bond, all in Young & Minns's building; the Columbian Centinel, Benjamin Russell, and the Boston Gazette, Russell & Cutler, in Spear’s Building; the Repertory, Dr. Parks; Recorder, N. Willis; Messenger, Intelligencer and some job offices, as well as other places of business, were preserved, yet more or less injured by the intense heat. The front wall was considerably warped during the fire from its erect position towards the street, but as it cooled, it resumed its upright attitude, and remained entirely unsupported. Part of each of the outward walls, and several parts of the interior wall, also remained, giving a fanciful aspect to the immense ruin. The pulling down of the walls after the fire, was a work of great difficulty and danger; it was however accomplished by placing long beams from the street to a part of the walls a little above the center, to prevent any part of them from falling upon, the opposite buildings. A cable was then passed round a part of the wall, properly secured, and by means of pulleys the resistance was easily overcome. The fall of the front wall particularly was a sublime spectacle. They were all brought to the ground in succession without any accident. Although the wind was very light, the coals and cinders were carried to a great distance. Burning coals fell at a distance of more than a quarter of mile, and buildings and ships were in danger of taking fire at a much greater distance. The Coffee House was owned by a company in 400 shares, who held by purchase from the original proprietor. It was built at a cost nearly half a million dollars, and was the cause of the failure of the Berkshire Bank, at Pittsfield, and the Farmers' Exchange Bank, at Cumberland, R.I. the failure of these banks caused a good deal of distress among individuals in Boston and elsewhere. Mr. Barnum, after the destruction of the Exchange, kept the city Hotel in Baltimore, a great number of years, with entire satisfaction to the public. This building occupied the site of the present Exchange Coffee House, Congress Square, and the streets in the rear and to the south of it extending from Congress to Devonshire streets. It was the largest public house, and one of the most elegant buildings at that time in the United States. Henry Clay, of Kentucky, was a lodger in the house at the time, and worked like a hero in passing water in buckets all night. He was seen by a gentleman of Boston, now doing business in Congress street, who assisted him in removing his trunk to his house, which stood where Simpson's stove store now stands , where he had quarters till he was removed to the residence of Mr. George Black, in Summer street. The scene was a terrible one, and called to the neighborhood an immense mass of people who could do nothing to check the destroyer. When the great dome fell in, the spectacle was awfully sublime. A volume of flame shot up to such a height that it was distinctly seen in Portsmouth N.H., a distance of 60 miles. Previous to the pulling down of the immense walls, it is said the ruins bore some resemblance to the Capital at Washington after its destruction by the British army."